I read biographies because it puts me in contact with better men and women, most of whom have died and whose lives can be measured with more accuracy and finality than the living. This is a sanctifying process, since it humbles me to recognize my own weakness in comparison to the greatness of others. When it comes to the recent biography of Eric Liddell, For the Glory, I have found a man whose sandals I am unworthy to untie. Liddell has been immortalized in contemporary culture with the Oscar winning movie Chariots of Fire. That film tells the tale to Liddell’s relatively short running career which cultivated in his surprising world record and gold medal finish in the 1924 Olympic Games in Paris. Previously, when I thought of Liddell, I always heard the synthesizer playing the familiar theme and thought of giving up a chance at more gold medals to honor sabbatarian traditions. The movie ends with a brief, abrupt epilogue that indicates that the hero died in an internment camp in China during WWII. Another picture emerges in other biographies I’ve encountered. The YWAM biography and other simplified biographies written by Christians paint a portrait of a saint, telling a powerful story for an audience looking for a Christian hero. Danny Akin has preached a sermon using the life of Eric Liddell as an extended illustration. I expected these sorts of biographies to paint Liddell in a positive light as the protagonist in a compelling sports movie and as a great missionary who died for the cause. When I picked up Duncan Hamilton’s recent biography, I was expecting a much less flattering picture. A missionary biography written by an apparent non-believer with no clear Christian sympathies printed by a secular publisher is bound to find all the dirt and put it out so everyone can see it. I expected to find private details with hints of suspicious activities at every turn. That, however, is not the case. The portrait of Liddell that emerges from this volume is of a man whose serious, meticulous devotion to God was rewarded by such a degree of sanctification that he was able to risk his life for Christ without thinking twice. In fact, the man once pushed two wounded men in a wheelbarrow through the countryside filled with Japanese aggressors because they would have otherwise died. He faced harassment, theft, confiscation of his property, and separation from his wife with a good attitude for the sake of the cross. The picture Hamilton paints is one of a saint who did great things for the Lord with a gracious attitude and without neglecting the other good things in his life as a consequence. The book is divided into three parts. Part One focuses on Liddell’s childhood through his Olympic victories. These chapters line up well with other biographies I’ve read and generally support the well-known story that has been seen on screen as Chariots of Fire. Part Two explores Liddell’s work as a missionary in China, including his courtship of his wife, his continued athletic efforts, and his focus on doing the work God called him to. An interesting wrinkle to the legend of Liddell is that he didn’t absolutely reject the possibility of running in another Olympics. His faith was not a call to asceticism. Rather, it was the British Olympic Committee that failed to engage a man who might have won the U.K. another gold. This section was largely new ground for me and very engaging. Part Three expands on Liddell’s life in the Japanese internment camp, about which much less has been known than about other parts of Liddell’s story. Hamilton conducted a host of interviews of other internees to expand the available information about a great hero of the faith. What Hamilton has done here deserves notice. He took a Christian hero whose story has been told before and he made it better. Hamilton added to the field of missiology by writing a careful history of someone who has been celebrated widely. He did this without slipping into dismissiveness of Liddell’s convictions or snarky digressions about the foolishness of his faith. Hamilton should be praised for adding a critical work on Liddell that doesn’t fall into the too common trap of attacking the biography’s subject in order to add interest. There are no “daddy complex” narratives or secret abuse allegations. What the reader gets is honest history told exceptionally well. Even if missionary biographies don’t keenly interest you, this book is worth your time. Hamilton writes so very well. His retelling of Liddell’s life story is detailed but lively, carefully crafted but not pedantic, honest but complimentary. In short, this is a great book that deserves to be read and widely. 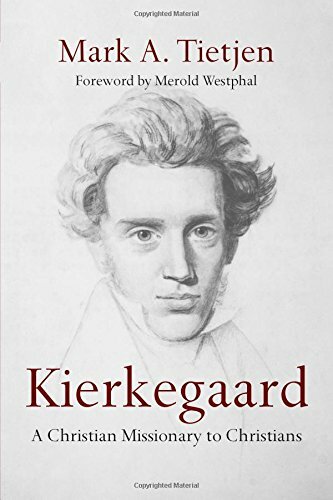 I reviewed a volume not too long ago in which Mark Tietjen presents the thought of Soren Kierkegaard in an attempt to convince the reader that reading Kierkegaard is a worthwhile activity for the contemporary church. I am inclined to agree with him based on his book. What struck me as perhaps the most significant lesson from the book was the call to be a Christian missionary to Christians. This is the subtitle of the book and it largely describes how Kierkegaard saw himself. It is, in our day, perhaps a necessary task. - If there are some who are Christians in name only, then one can be a Christian missionary to such Christians. - If there are some who have inherited a perverted form of Christianity and know nothing better, then one can be a Christian missionary to such Christians. - If there are Christians who value created goods over the Creator, then one can be a missionary to such Christians. - If there are Christians who struggle to trust in God and his goodness, then one can be a Christian missionary to such Christians. - If there are Christians who fail to believe God can redeem even the least redeemable person, then one can be a Christian missionary to such Christians. - If there are Christians who lose hope that God’s kindness, forgiveness and redemption extend even to them, then one can be a Christian missionary to such Christians. - If there are Christians who ‘speak in tongues of angels,’ and so on, but have not love, then one can be a Christian missionary to such Christians. A necessary step into understanding what Tietjen is proposing, and what he claims Kierkegaard supports, is altering the concept of "missions." This is by no means a new conversation, but it is one that hasn't always found escape from the halls of academia. In general terms "missions" refers to the concept of going out to evangelize, do good works, and spread the good news of Christianity. When you think "missions" think vocational missionaries, evangelistic meetings, and a focused effort to reach people who have not previously accepted the gospel. The term "mission" encompasses those things, but it is an umbrella term that defines a broader range of activity. Advocates of the concept of "mission" are affirmative of focused evangelistic efforts, but also see the gospel importance of daily living. The faith and work integration movement has this vision. Every action has the potential to preach the gospel in some way. Behind Tietjen's explanation of Kierkegaard as a Christian missionary to Christians is this understanding of the purpose of the Christian life. It broadens the pool of gospel workers to include all truly converted Christians and broadens the work that is considered to promote the advance of the gospel. We live in a post-Christian America. Perhaps even a post-reality America. Although I do not believe that America was ever a "Christian nation" in the sense that the nation had a divine mandate or was especially blessed because of its faithfulness, I do see in the pages of history a general Christian consensus. Obviously that consensus has decayed. And yet, a form of cultural Christianity continues on. This is the sort of Christianity that allows people voting for an immoral, authoritarian candidate for the highest office in the country to claim that he is somehow chosen by God for the office. (Which he may be, just not for the reasons they suppose.) Many of these people claim to be "Evangelical Christians," but do not darken the doors of any church on a regular basis. This is the sort of Christianity that needs Christian missionaries. Or, on the other side of the political spectrum there are individuals who brand every form of social deconstruction a form of "progress" and make public arguments that adherence to any sense of moral law outside of "judge not" is sub-Christian. There is a large block of such professed Christians in the United States that need the gospel as much as your Buddhist neighbor. They need a vision of the transformative power of conversion, where the Lordship of Christ is apparent over every corner of life. This is the sort of application that Tietjen is calling for. The gospel must be evident in every area of the life of every Christian. I must say that on this point I agree with him wholeheartedly. Today marks the 142nd anniversary of Lottie Moon's landing in China to take the gospel to that nation and to those millions of people. She's been a hero to many for her willingness to leave relative comfort, social position, and a loving family behind in the United States to go to a life of discomfort and perpetual struggle. She was fiercely orthodox, even forgoing her marriage to Crawford Toy over his abandonment of the veracity of Scripture. Lottie Moon was a woman of conviction who lived much of her life so that others might find new life in Christ. Her faithful letter writing to raise funds for all Baptist missionaries led to her becoming the namesake of the Southern Baptist Convention's annual Christmas Offering. Because of her faithfulness, her name has become a rallying point for Southern Baptist Missions. Lottie Moon's story is one that is compelling and should increase our faith in God's providence and renew our desire to go to tell of him to the nations. Consider praying a prayer of thanksgiving for faithful saints like Lottie Moon. 1. She was born on December 12, 1840 into a wealthy plantation owning family in Virginia. 2. As an adult she was only about 4'3" tall. This is about the height of an average American 8 or 9 year old girl. 3. Lottie Moon was one of the earliest pioneers in women's education as a graduate of Albemarle Female Institute at Charlottesville in Virginia. She was academically gifted, particularly in languages, which would help her master Chinese. She earned an M.A. in Classics in 1861. 4. She was converted from a vehement opponent to Christianity to a faithful Christian in 1859 under the teaching of John Albert Broadus, in Charlottesville. 5. On July 7, 1873, the Foreign Mission Board of the Southern Baptist Convention appointed Lottie Moon as a missionary to China. She actually followed her sister, Edmonia, who had been appointed as a missionary before her. 6. She helped institute the contemporary missions policy of allowing furloughs for missionaries. Moon spent 14 years on the field before returning to the United States for a break. Prior to that innovation, missionaries who left their home country were presumed to be leaving forever. 7. Lottie Moon was a vocal advocate for ending the practice of foot binding in Chinese culture. She helped to turn the tide on that barbaric practice. 8. Her letter writing was a means of encouraging missionaries to leave home for the sake of the gospel during her day. They have continued to inspire missionaries to be faithful to God's calling to the present. 9. On December 24, 1912, Lottie Moon died on a ship off the coast of China. She weighed only 50 pounds and died of starvation because she was foregoing food to try to save her Chinese friends and neighbors during a famine. 10. In 1918, the Women's Missionary Union (WMU) named their annual Christmas offering after Lottie Moon, the woman who had strongly encouraged them to start the practice. Christian History feature article on Lottie Moon. “To all our subjects who may see this and also to others, may God save you, know that we have prohibited the transport of slaves by sea in all our harbours and have closed the markets which are for sale of slaves through all our dominions. Whoever therefore shall ship a raw slave after this date will render himself liable to punishment and this he will bring upon himself. Be this known.” – From a notice, posted on a customhouse in Zanzibar on June 5, 1873, about 1 month after David Livingstone’s death. Every biography of David Livingstone picks up on a different aspect of his life. He’s hailed as a paragon of missionaries for abandoning the colonial model of a mission station to push to the interior of Africa. Unfortunately, by most ways missionaries are measured, he was not terribly successful, with few converts in his lifetime. He is sometimes celebrated as a scientist due to his medical discoveries, particularly his pioneering of the treatment of quinine for the prevention and treatment of malaria. Often he is known as a great explorer because of his expeditions into the heart of Africa to map the territory and to attempt to find the headwaters of the Nile. Jay Milbrandt’s recent biography, The Daring Heart of David Livingstone: Exile, African Slavery, and the Publicity Stunt that Saved Millions highlights an element of Livingstone’s life that is often little publicized: Livingstone was passionate about ending the brutal slave trade in East Africa. In fact, the closing of the slave markets in Zanzibar, highlighted in the statement above, was one of the greatest accomplishments of his career, which unfortunately he did not live to see. Reading of Livingstone’s life is heartbreaking. He failed at several major efforts. He won the hearts of the people of Britain and America due to his discoveries and his missionary accounts. But then he lost the crowd’s applause due to his public failures, which were driven in part by his personal weaknesses. He was, at times, a poor leader. By any reasonable metric he was a terrible father whose children barely knew him, if at all. Still, his wife had every reason to despise him and yet she loved him. I have read several biographies of Livingstone before. I have at times wondered why he is such a celebrated hero. Milbrandt has done a service by highlighting Livingstone’s greatest achievement. This is a dark book at many points. In order to illustrate the importance of Livingstone’s fight against the slave trade, Milbrandt reveals some of the gruesome details of the conditions in East Africa during Livingstone's time. For example, in order to destabilize conditions in an otherwise generally peaceful region of Africa, slave traders sent parties in to murder as much as to capture slaves. Villages would be wiped out with a few survivors taken captive, tied together, and sent on a death march toward the coast where they would be sold to the highest bidder. Disease, starvation, and exhaustion took the lives of many of the captives before they reached their destinations. Their families slaughtered, the captives in the slave camps died because their freedom was gone. They ceased to live because they had nothing left to live for. Slavery was a misery worse than the physical ailments that beset them. The blackness of the evil of slavery in that context must be understood if the value of Livingstone’s life work is to be recognized. One of the more intriguing twists in Livingstone’s fight for abolition is that it was a publicity stunt that had the most impact in stopping the brutal slave trade. Livingstone had been reported dead by some of the natives who had accompanied his expedition to find the headwaters of the Nile. In order to scoop the British papers, the New York Herald sent Henry Morton Stanley to go find the wayward explorer. Against all odds, Stanley was successful. After a series of interviews over a period of four months, Stanley left Livingstone, unable to convince the explorer to return to civilization. Livingstone did, however, send journals and letters with Stanley, which were influential in spurring political action in Britain to lean on the African nations to end their trade in slaves. Contributing to the building momentum toward abolition was the dynamic between Britain, who had ended slavery in the early 19th century, and the United States, who had only ended their barbaric human trafficking after a bloody and divisive Civil War. Stanley’s efforts, funded by a US paper helped to shame the British into a more forward action against the slave trade. Stanley’s admiration for the man, despite his failings, helps explain why Livingstone’s legacy is as great as it is. It also helps to explain why his wife, Mary, risked disease and death to be with her husband, though he had frequently left her behind for years at a time during his explorations. It also explains why so many of the Africans loved the man so dearly. I am thankful to Jay Milbrandt for investing his time to write this biography. He has done a good thing to draw out the victory against slavery that came through Livingstone’s work. Milbrandt illustrates the reality that many great men and women had serious failings, and that despite these failings their memories should not be cast aside forever, nor should their weaknesses be ignored. "I didn't know any Vietnamese people. I'd never heard the Vietnamese language. . . . It was just something the Lord laid on my heart that I couldn't get away from. . . . Sometimes I think the call of God is something of a mystery."